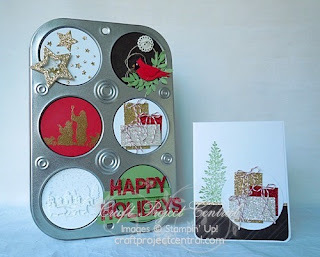 Just Julie B's Stampin' Space: Altered Muffin Tin Decor & Greeting Card! Altered Muffin Tin Decor & Greeting Card! As the holiday season is nearing, wouldn’t it be fun to decorate your home with this holiday décor item? Perfect for your table, wall, or refrigerator, this sweet 3-D project could also work as a countdown calendar, and for hiding holiday treats and treasures. Give your craft punches and dies a workout to make holiday scenes, getting a glimpse of all the fun and precious things you are looking forward to. This project is also great for holiday stamp camps and small classes. This sweet project was made by Monika Davis, and you can get her tutorial when you subscribe to the month of November over at Craft Project Central. Honeycomb Star Ornament Gift Set! Hello December Organizer & Holiday Accessories! Thankful for a Quick Sketch Challenge! Advent Calendar Banner Box Set! Peaceful Pines Stamp-a-Stack & Card Case! Decorative Masks Sampler Inspiration Canvas! NOEL Square Pillow Box Garland Gift Set! Poinsettia Christmas Tree & Picture Frame! Self Closing Box for Stamp Class this Week! Creation Station Blog Hop - Lighthearted Leaves!